UP Junior Resident Doctor Recruitment 2018 Recruitment to the post of UP Junior Resident Recruitment 2018 (Non-Academic) session 2018 i.e. from upcoming months. For More details of UP Non PG Junior Residents Doctor Recruitment 2018 regards to age limit, educational qualification and selection process is mentioned below. 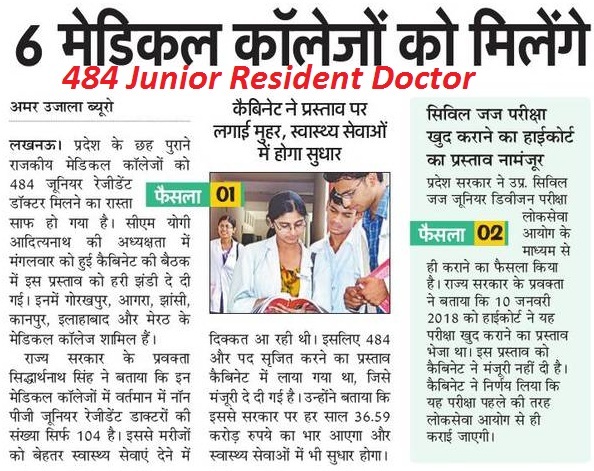 UP Rajkiya Medical College Junior Doctor Recruitment 2018:- UP Cabinet has given statement to fill 484 posts of NON PG Junior Residents Doctor Recruitment 2018. Through endurance of Siddhartha Nath Singh (Charge Taken as Health Minister) has said six districts (Agra, Allahabad, Meerut, Kanpur, Jhansi and Gorakhpur) six medical college have been selected. Junior Resident Doctor Vacancy in Lucknow: - On current period only 104 Junior Residents Doctor working in 6 Old Government medical of Uttar Pradesh. But after checking condition which is now become worse to cultivate health sector crowd make by patients. UP Medical College Junior Resident Recruitment 2018:- Talking about salary of Junior Resident Doctor than allocated budget of Rs 36 Crore passed every year. 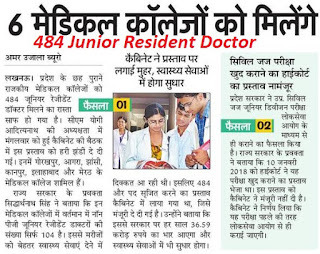 UP Junior Doctor Recruitment 2018 Latest News: - UPPSC Lok Seva Ayog may take responsibility to take application form of 484 Junior Residents Non PG Doctor. Information regarding UP Junior Residents Faculty Recruitment of Selection, Salary Scale and How to apply is mentioned in below. Junior Resident Doctor Syllabus 2018:- MBBS from a Medical College outside India and have passed the MCI Screening test for registration, marks obtained in percentage in the MCI screening exam will be considered for merit list. These students must enter the MCI Exam percentage at the appropriate place in the Online Application Form. Post Name: - Junior Residents on Contractual basis. Should have Graduate/Post Graduate from recognized university. Age Limit: Candidates age should be below of 21 year to 40 years of Age Relaxation is applied under General OBC SC ST rules. Educational Qualification: Junior Residents MBBS (including completion of Internship) or equivalent degree Recognized by MCI. The candidates should have passed MBBS/BDS (including completion of Internship) or equivalent degree recognized by MCI/DCI. Selection Process:- On the basis of rank obtained in the AIIMS P. G. Entrance Examination The merit for AIIMS, Medical College, Medical Hospital in UP MBBS graduates will be made on the basis of their aggregate marks in the I, II and final Professional examinations. Application Fee: - soon updated.